Sloppy Joe and Hemingway were Friends? 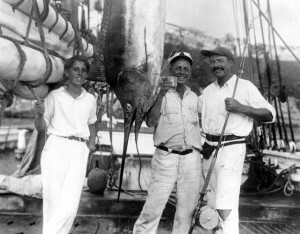 Joe Russell, the famous owner of Key West’s Sloppy Joe Bar, was friends with Ernest Hemingway. Along with Charles Thompson, who was a hardware store owner, Russell would regularly go fishing with Heminway. In fact, Joe Russell was the inspiration and model for the character of Freddy in Hemingway’s To Have and Have Not. What’s more, after Joe Russell died, pieces of Hemingway’s original manuscript for To Have and Have Not was found in the Sloppy Joe Bar! A picture of Joe and Ernest on a fishing trip! Posted in Key West | Comments Off on Sloppy Joe and Hemingway were Friends? Ernest Hemingway’s wife, Pauline Pfeiffer, had an uncle who bought them that famous 907 Whitehead Street home in 1931 as a wedding present. After moving in, Ernest had a swimming pool installed for $20,000 dollars, which is $250,000 in modern values. The amount was so great that Hemingway is rumored to have put a penny into the wet concrete, saying, “Here! Take the last penny I’ve got!” The penny is still there. Go see for yourself! 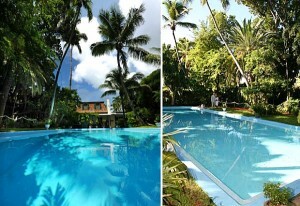 The beautiful pool at the Hemingway House! In fact, the phrase “the Boston Tea Party” did not become the standard description until many years later. In reality, unlike Currier’s depiction, there were few men who actually disguised themselves as Indians. Interesting! San Diego Big Bay Whale Festival! Old Town Trolley and the San Diego Seals are both proud sponsor of the 2014 San Diego Big Bay Whale Festival. This fun filled, FREE event will take place on Saturday, January 25 at the Port Pavillion on Broadway Pier from 11 am to 3 pm. The event will feature three live bands: Moon Dog at 11am, Flamenco with Roots at 12pm, Jinnah Williams at 12:30pm, and James Gibson Band at 2pm. Back by popular demand will be the our Flash Mob at 1:30. Lots of fun activities for kids: face painting, obstacle course, balloon art and a jumping house. Lots of prizes will be given away, so don’t miss out on this great day! Posted in , San Diego | Comments Off on San Diego Big Bay Whale Festival! 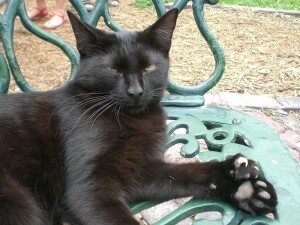 Ever been to Ernest Hemingway’s house and seen one of the famous polydactyl cats? In other words, the cats with six or seven toes on their paws. While Hemingway lived in his 907 Whitehead Street house, he cared for his beloved cat Snowball, whose offspring still roam Ernest’s home’s walls. They are so special and loved by Key West that the Key West City Commission exempted the Hemingway house from the law that prohibits having more than four domestic animals in one home. Look at it’s many toes! How would you like to be swiped at with those paws? 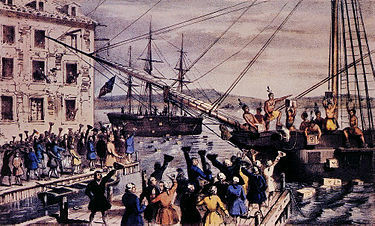 The Boston Tea Party is an international symbol of American patriotism and independence. It’s had influence on many American political movements… especially the Tea Party Movement! This movement began in 2009, which is nearly 238 years after the Boston Tea Party. Those involved in this movement advocate for a better system for decreasing American national debt and the federal budget deficit. They hope to do this by reducing US governmental spending and taxes. Neat, huh? 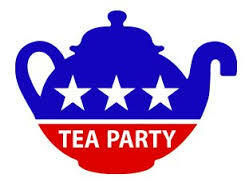 Posted in Boston | Comments Off on What is the Tea Party Movement? You are currently browsing the Old Town Trolley Tours Blog blog archives for January, 2014.